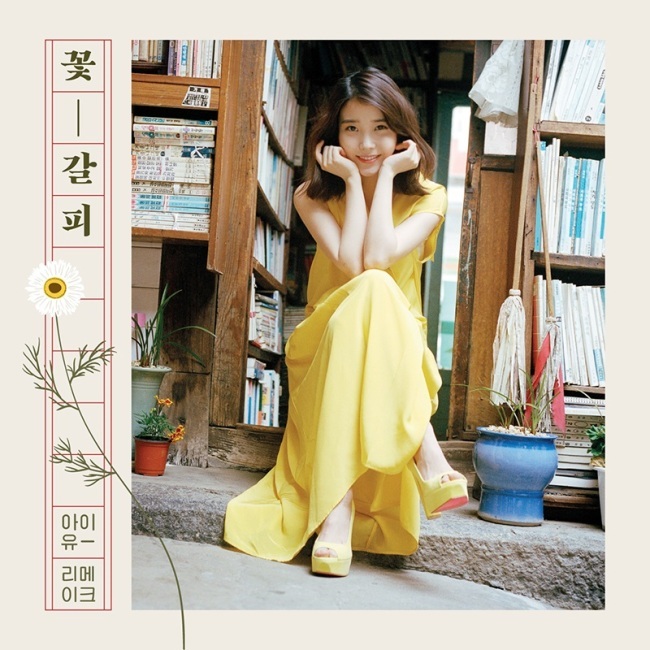 Popular singer IU is sweeping the local music charts with her first covers album “A Flower Bookmark,” which was officially unveiled Friday. All seven tracks included in the album immediately topped the major music charts including Melon, Naver Music, Daum Music, Olleh Music and others upon their release at midnight. The title track “My Old Story” continues to retain the No. 1 spot while other tracks remain inside the “Top 10” list. “A Flower Bookmark” features IU’s reinterpretations and rearrangements of past hits by veteran Korean singers from the 1970 to the 1990s. The lead single “My Old Story” is a remake of the 80s singer-songwriter Cho Duk-bae’s original, which reminisces about a one-sided love from the past. The video for the song was released on LOEN Tree’s official YouTube channel on Friday. IU also showcases rearrangements of the Kim Gwang-suk’s “Flower,” Kim Wan-sun’s “Pierrot Laughs At Us,” Lee Moon-sae’s “When Love Passes By,” Clone’s “Boom Ladi Dadi,” Sanullim’s “Meaning Of You” and past singer Kim Hyun-sik’s “Dreams In Summer Night” on the new album. IU is slated to perform eight live concerts at Sogang University’s Mary Hall in Seoul from May 22-June 1. Tickets are priced at 88,000 won and can be purchased through Interpark.